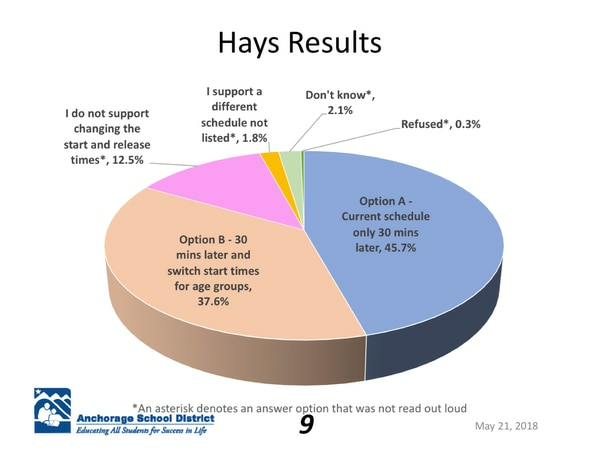 Anchorage parents are split over possible changes to school start times, according to survey results presented to the Anchorage School Board Monday. The recent telephone survey is the district's latest step in its process to determine whether or not it should change school schedules starting in the 2019-20 school year. While research shows older students would benefit by starting school later, the district has said, a limited number of buses and time would mean that to do that, everyone's schedules would have to shift in some way. Two weeks ago, a consultant hired by the district to study school start times presented two new possible scheduling scenarios to the board: Either move all school start and end times back by 30 minutes or move schedules back and swap the start-time order. The second option would have elementary school students starting classes first at 8 a.m., high school students starting second at 8:45 a.m. and then middle school students starting at 9:30 a.m. According to the results from the telephone survey, 45.7 percent of 383 randomly selected Anchorage parents said they liked the first scenario best, 37.6 percent preferred the second scenario and 12.5 percent said they did not support a change. The margin of error was plus or minus 5 percent, said Adam Hays, research director at Hays Research Group, which conducted the survey. However, some school board members questioned how accurately the survey reflected what parents wanted. School board members Starr Marsett and Dave Donley said they received complaints from parents, who told them that while they were asked which of the two schedule changes they liked, they were not asked whether they preferred no change at all. Anchorage School District Superintendent Deena Bishop told the board that it has the option to not act on start time changes, leaving the schedules as they are. She said the district has also already asked the community whether it wanted a change or not. Now, she said, it wanted to determine if there was a change, what parents preferred. According to feedback from the district's community open house meetings earlier this year, 48 percent of those who attended said they wanted to keep school schedules the same, 43 percent were split among three possible changes and 9 percent said they had no preference. Shannon Bingham, the district's consultant, told the board Monday that the two proposed scheduling options presented this month would cost the district little to nothing to enact. If the Board wanted middle and high schools to start at identical times, instead of staggering schedules, it would cost about $9.5 million for additional buses plus about $7.7 million more each year in operational costs, he said. School Board President Marsett said the board would continue discussing school start times June 2 at its daylong retreat. With two new board members, she said, they needed more time to talk about the possible changes. She said she did not believe the Board was leaning one way or the other as of Monday. "I think the board really is up in the air," she said.